Enhance your evening soak or swim with the multi-colored LED Highlights Lighting™ system. 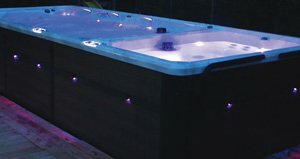 Standard on all swim and fitness spas, this collection of soft glowing pinpoint underwater lights plus 6 lit cascading water spouts on the Synergy and TruSwim® Series will enhance the sights and sounds of your backyard. Your new outdoor oasis will without doubt be the envy of the neighborhood. Adding the LED Eclipse Lighting™ package of 16 LED cabinet sconces (Vitality Series features 12 sconces), creating a beautiful glow on the hand-crafted M Series™ designer cabinet. Reach a new level of style and elegance as you enjoy a starry night just a little bit longer while relaxing in your swim spa. Take delight in the underwater shimmer of 6 lit Synergy ProTM current jets with the Oasis LED LightingTM package. 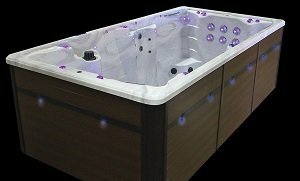 Paired with the radiance of up to 13 topside air and diverter controls, this lighting option will turn your SynergyTM FX Series swim spa into your own sparkling backyard oasis. Topside mounted, marine-grade speakers and in-cabinet subwoofer turn your swim spa into a natural amphitheater for complete enjoyment with the BlueTune™ music system. Set the mood for exercising, relaxation or a friendly gathering as you manage the playlist and volume conveniently from inside or out of the swim spa with any smart phone or mobile device.